Deporting of Children Begins in the U.S. The United States has deported its first group of children. On Monday, a flight landed in Honduras with the first children to be deported since President Obama made a pledge to speed up the overall process of sending undocumented immigrant children back to their countries in Central America. Fleeing poverty and violence, children in record numbers from Guatemala, El Salvador and Honduras have crossed the Mexico-U.S. border over the past 12 months. This has tested the border facilities for the U.S. and sparked intense debate about the best way to solve this humanitarian problem. 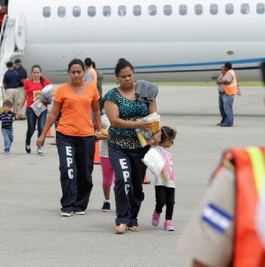 The charter flight on Monday flew to San Pedro Sula from New Mexico. The city of San Pedro Sula has the world’s highest murder rate. On board the flight were 17 adult women, 12 girls and 9 boys. The children were between the ages of 18 months and 15 years, said an official from the Honduran government. The children left the airport and looked happy, while being loaded on a bus. During a period of eight months that ended June 15, over 52,000 children were stopped and detained by Border Patrol agents of which the majority were from Central America. That total was double what the previous year was. Officials believe that tens of thousands were able to slip through as well. Obama is beginning to face increased pressure over the surge of minors who are unaccompanied entering the U.S. Advocates of immigration are calling on the White House to address the migrant’s humanitarian needs. Republicans on Capitol Hill are blaming the current crisis on the immigration policies of Obama. They have called for him to make the border more secure. The White House has stressed that children from Central America who cross illegally into the U.S. will be returned home and that process would speed up starting this week. El Salvador, Guatemala and Honduras have all suffered from violence involving gangs and the offshoots of the drug cartels in Mexico who use the area as their staging area for drug trafficking operations. Juan Hernandez the President of Honduras blamed the drug policy in the U.S. on sparking violence and the increase in migration into the U.S.